SUPER DUPER ULTRA BREAKING NEWS: GRAVITY FALLS SEASON 2 EPISODE 12 AND 13 FULL EPISODES ACCIDENTALLY LEAKED!?!!!!? 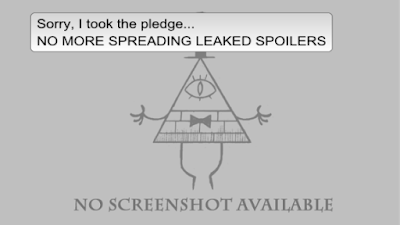 ?- NO SPOILERS- I PROMISE- Take the Pledge not to Spread! So many have taken the pledge not to share these stuff around. If you see this stuff, either don't watch it or flag it and tell Disney. Currently, all known sources have been blocked by Disney, and if you see any, please, and once again, please report it. Remember, we can all take the pledge: DON'T SPREAD SPOILERS! Be a bit more patient. If you can wait until July 13, 9 PM (US Time), you will be perfectly fine. Gravity Falls will be back fro hiatus, and new episodes will come every two weeks, meaning you won't have to wait long for new ones, followed by freedom. Today was my last day of school. Friday I will be leaving New Jersey. Forever. I will go on vacation to Turkey for about two months, then I will return and make posts more frequently! , then I won't return, instead move to Dallas, Texas. This may end up being my last blog post I have made in NJ, but definitely not the end of TTHT (This and That, Here and There). It will continue as usual, even with me not around in New Jersey. --Subscribe and stay tuned to TTHT! View daily! Show it to your friends! Give it more views! Make the view counter happy!